Hey, y'all! Recently I participated in the Handmade Gift Exchange that Linda of Craftaholics Anonymous hosts twice a year. When I was paired with my partner Julie, I asked her about her likes. 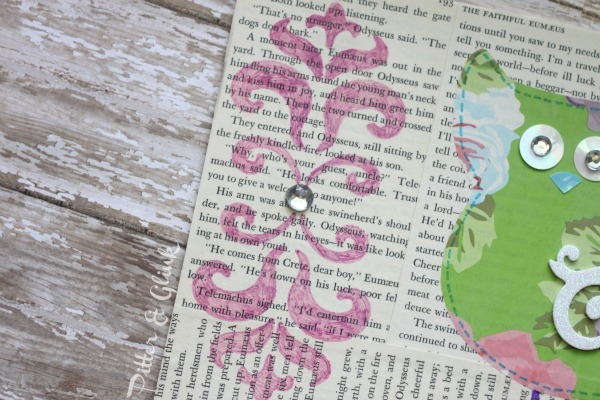 She listed dragonflies, owls, books and the colors purple and green as some of her favorites. When I posted about the gifts I received for the Handmade Gift Exchange, I gave you a peek of the gifts I created for Julie. One of those gifts was a piece of art combining several of her likes. 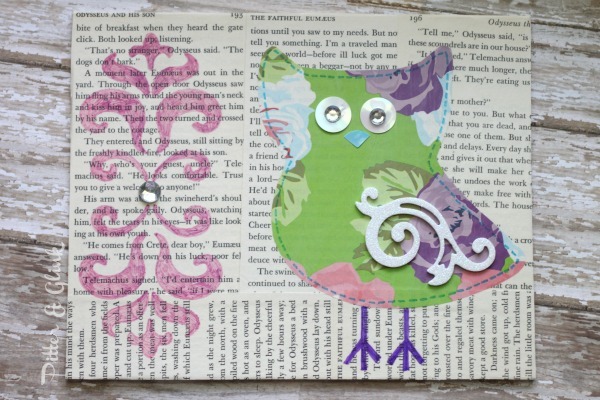 I'm calling it Julie's Book Page Owl Art. I used Mod Podge to adhere the strips to the canvas. 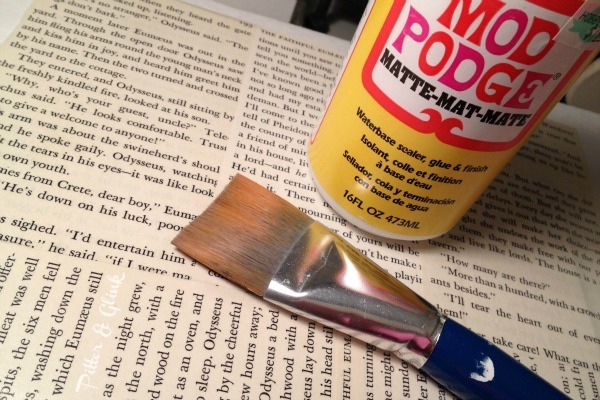 I painted a layer of Mod Podge on the canvas and smoothed the pages over that. When dry, I painted a layer of Mod Podge over the entire canvas to seal it. I then had a blank book page canvas. Because Julie said she liked owls, I thought an owl silhouette would be perfect for the canvas. I had a wooden owl, so I traced the owl on the back of some pretty wrapping paper and cut it out. 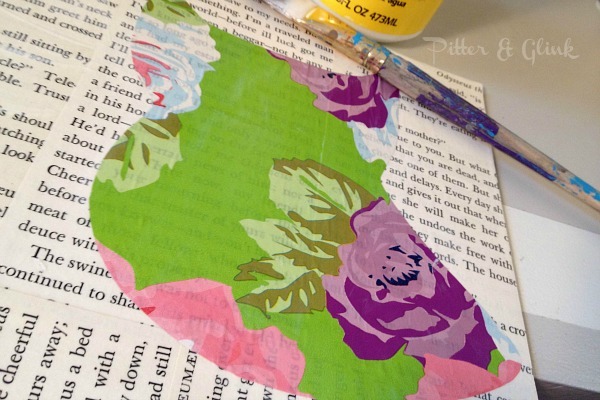 I used Mod Podge to attach it to the canvas the same way I attached the book pages. When it dried, I added detail to the owl. I used a Sharpie to draw feet for the owl and a stitch detail around its body. Since the owl was on the right side of the canvas, I wanted to put something on the left side to balance it. I stenciled a damask pattern on that side with a Sharpie. I then sprayed the whole piece with a couple of coats of clear spray paint. Then I added a face and a few other details to the piece. For the eyes, I hot glued sequins and rhinestones. For the beak, I cut a sequin in the shape of a beak and glued that as well. 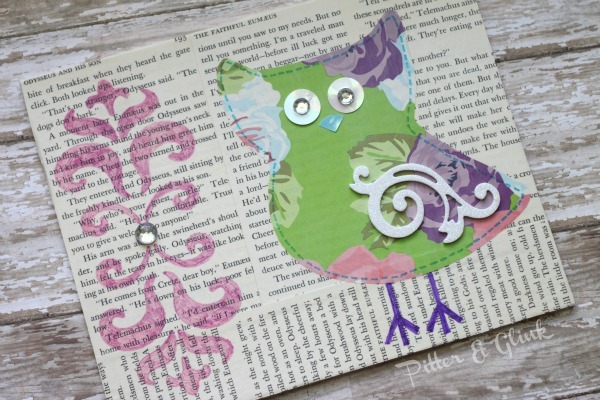 An adhesive-backed scrapbook flourish became the owl's wing, and the final touch was a rhinestone in the middle of the damask. Since I used a flat canvas, I told Julie that she could easily frame the piece by popping the glass out of a store-bought frame and inserting the owl art. 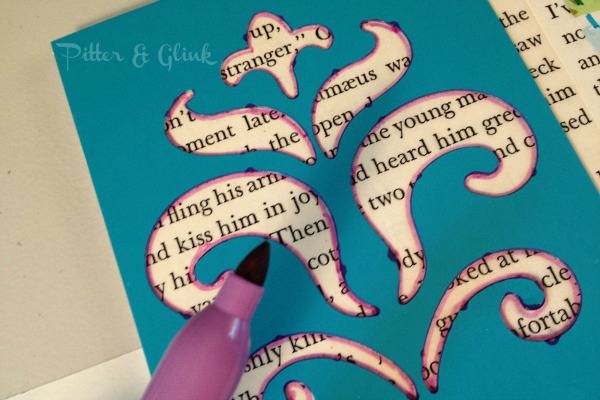 If you want to create your own book page art, you can use any silhouette and color combo your heart desires! Isn't that always the great thing about crafting? You can customize any project to fit your tastes. This is so cute! You know I'm a sucker for owls :) I love your creativity. This is beautiful! That is so cute! I love owls! Bethany, this is so stinkin' cute! I SSSSSOOOO LOVE this! Adorable! 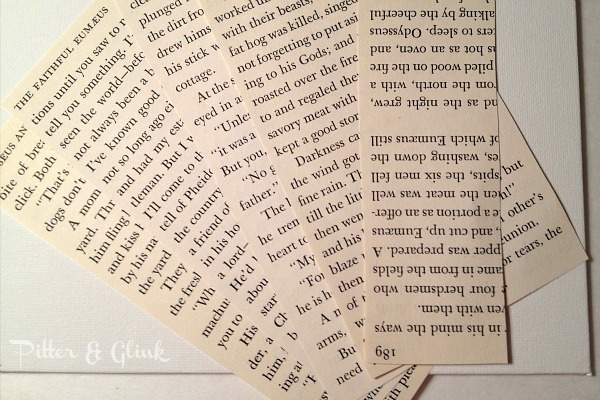 I love the wing and stencil...and of course the book pages! You are so clever! I love this! I sell Origami Owl and my home office is decorated with owls. I am always looking for something new and different to add. This would be a sweet gift to give to my team members. Thank you for the great idea! 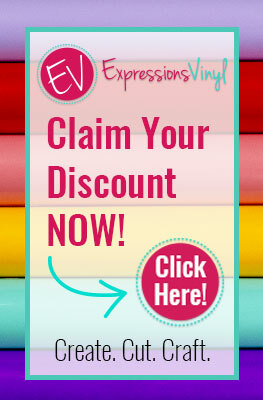 I found your blog through Hometalk (loved the craft room reveal). 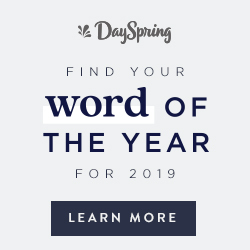 I can't wait to be able to explore your site more! This is so adorable! I always feel like I do better if I have a direction to go when crafting. If I start from mental scratch it ends up never being completed. What a fun project and it's perfect since owls are trendy these days. Great job! I love how this turned out! 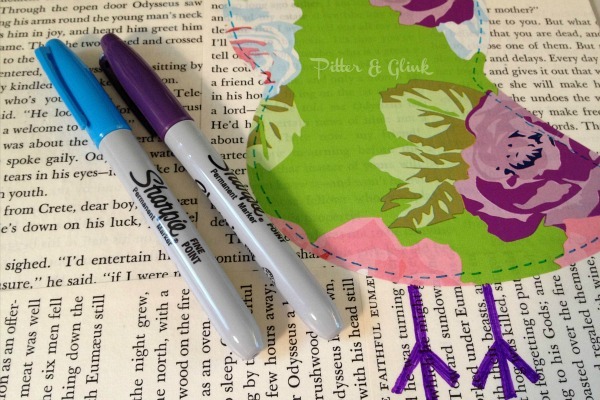 The book page background is awesome- and great idea cutting the owl out from wrapping paper! This is so beautiful. 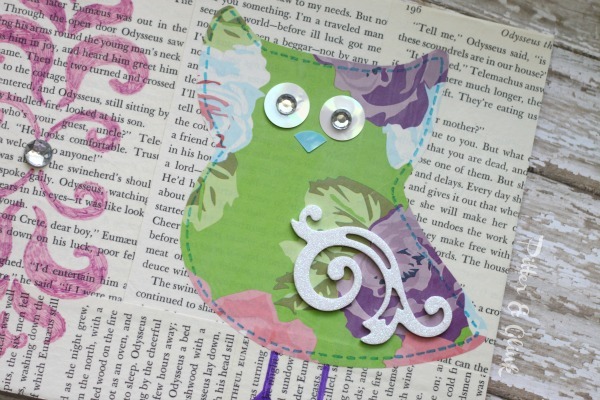 I love the owl and the whole idea of using a book page. Lovely.